Manhattan’s Street Grid: Great or Greatest or . . . Not? 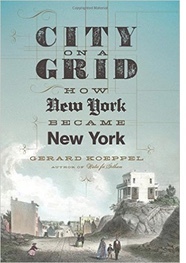 Gerard Koeppel is the author City on a Grid: How New York Became New York (Da Capo Press). Manhattan’s iconic rectilinear street grid has been called “the most courageous act of prediction in Western civilization.” So said architect Rem Koolhaas in 1978. The grid plan had been chosen for the thinly populated and naturalistically varied island by a three-man commission--dominated by aging and irascible Founding Father Gouverneur Morris—in 1811. Back then, the city proper was confined to the narrow, crooked, impossibly random streets at the low southern tip of what the Lenape called “the island of hills.” The bulk of the island then was abundant in deep valleys, rocky ridges, thick forests, and countless streams, ponds, and swampy bogs. As the generations ensued, the grid relentlessly overspread the land, flattening and filling it on the march north. 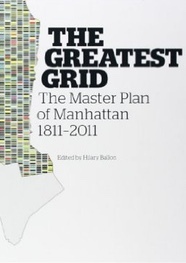 More recently, Manhattan’s Cartesian flatland has been proclaimed “the greatest grid.” The superlative was first used in 1988 in the title of Indiana State history professor Edward K. Spann’s oft-cited essay, “The Greatest Grid: The New York Plan of 1811,” which appeared in Two Centuries of American Planning (John Hopkins University Press). Perhaps it was just an editor’s catchy phrasing, because Spann doesn’t include “the greatest grid” in his text or explain how New York’s grid was so. Professor Spann died in 2004, so he was not around to see his superlative repurposed as the name of the bicentennial exhibit and companion volume on Manhattan’s rigid defining order: “The Greatest Grid: The Master Plan of Manhattan 1811-2011,” brilliantly assembled by NYU urban studies professor Hilary Ballon for the Museum of the City of New York. The exhibit was very popular; the companion volume (to which I contributed) has quickly become the starting point for all serious research about the grid, much as I. N. P. Stokes’s century-old six-volume masterwork, The Iconography of Manhattan Island, 1498-1909, remains the bible for all serious New York researchers. (Stokes was not a grid fan: “The new plan was entirely deficient in sentiment and charm, and with its gradual development, little by little, the individuality, the interest, and the beauty of one choice spot after another have been swept away [until] scarcely anything remains to remind us of the primitive beauty and the fascinating diversity of natural charms which we know Manhattan once possessed.”). But, like Spann, neither Ballon nor anyone else who has asserted that New York’s grid is “the greatest” has explained how it is so; that is, is it the greatest merely in quantity or in some ineffable quality? As to quantity, the Manhattan street grid of thousands of rectangular, similarly-sized blocks is the greatest in the world. It covers over ten thousand of Manhattan’s roughly fourteen thousand acres, the narrow southern and northern tips excepted. The grid of many streets (though relatively few avenues) delivers the highest percentage of land allocated to roadway—36%--of any earthly city. As to quality, arguably a deeper measure of greatness, does the grid measure up? It lacks radials, which move things with feet and wheels directly where they want to go, instead of out of their way around what in Manhattan are many thousands of right-angled corners. It lacks circles, which keep traffic moving. It lacks curvilinears or broad boulevards that add beauty. It lacks open spaces, especially irregularly shaped ones, which relieve dullness and provide informal places of public gathering. It lacks decongesting back alleys for off-street delivery and services. Manhattan’s grid in particular lacks enough north-south routes, making the few avenues and the many overlong blocks of streets congested places of limited escape. These are age-old complaints about the Manhattan grid. There are newer ones, relevant now to a mass-transporting, post-industrial, resource-conscious city. The grid is not green: no open space for water features that cool, or urban farms that sustain; aligned with the land not the sun, the grid provides poor solar energy siting; having obliterated natural contours, the grid turns rain from resource into waste. And, it remains so damned congested. These complaints, old and newer, are familiar to urbanists. What is really new, as I write in City on a Grid, is an understanding that the grid, no matter how much many love it for its predictability, organization, and power, was not the greatest or anywhere near great in concept. In fact, it was not so much a plan as an excuse for one, not a thoughtful blueprint for an extraordinary future city but a hasty outline by a tardy commission on a deadline. A plan offered unasked in 1803, by French-born architect Joseph Francois Mangin, the designer, among other notable buildings, of New York’s now landmark City Hall, envisioned an island of gridded segments, varying in size, density, orientation, and natural situation. Mangin’s plan was the first ever proposed for the future development of the city. The city government loved the Mangin plan, briefly, until its top street official, a doctor named Joseph Browne, trashed it. Browne, recently appointed to the position through the influence of his dominant brother-in-law Aaron Burr, apparently was doing Burr’s vengeance for his protégé Benjamin Latrobe’s stunning loss to Mangin in the city hall design competition the year before. Following Browne (and Burr’s) lead, the undermanned and easily manipulated city government rejected Mangin’s plan; then, wistful, wished it had another one. In 1807, the city finally asked the state for a commission with absolute authority to come up with a binding plan. That commission, of Morris, state surveyor-general Simeon De Witt, and major New Jersey landowner (and Morris nephew) John Rutherfurd, was given four years. Unlike the deep commitment of Morris and De Witt on the contemporaneous commission creating the Erie Canal, the Manhattan street commission was mostly a distraction for its members. Finally, with the clock ticking down, they chose, without acknowledgment, to expand a 1796 plan for the Common Lands, a tract of undesirable city-owned “waste” land, some 1,300 acres in the alternately hilly, swampy, and still remote center of the island. 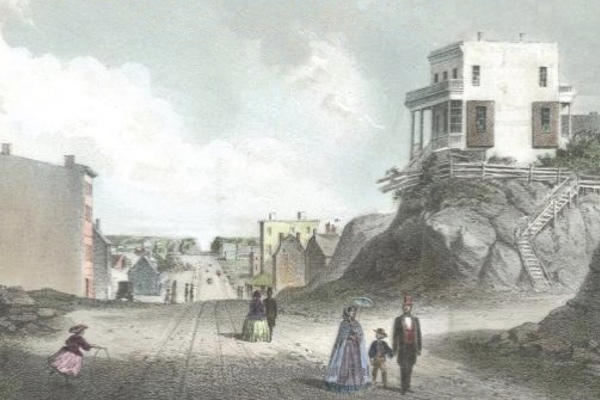 The cash-poor city government, hoping to parcel out and sell off its Common Lands, had hired surveyor Casimir Goerck who mapped out three parallel north-south roads 920 feet apart, creating two central stacks of five-acre rectilinear lots each 260 feet tall, the top sixty of those feet designated for parallel cross streets that were never laid. Sales of these large, exurban lots were relatively few, but if the numbers seem familiar, they should be. Fifteen years later, the Morris commission placed 4th, 5th, and 6th Avenues exactly where Goerck’s East, Middle, and West roads had partially materialized, put sixty-foot streets two hundred feet apart along the lines of Goerck’s phantom streets, and created thousands of five-acre blocks. The grid is just Goerck writ large, but in its maddeningly brief 1811 report announcing its plan, the Morris commission never once mentioned Goerck or the Common Lands. It just expanded Goerck’s map ten-fold and with little fanfare called it a day. The plan was barely reported in the city’s newspapers. No commissioner, even the prolific Morris, ever fully explained their decisions. Perhaps they were embarrassed, or just didn’t care. Thus, the “greatest grid”: an urban epic forged from a country tale. What does it matter that Manhattan’s great grid had a very common birth? It means that we may have an easier time letting it go when the time comes to change it, that we may be more willing to change it for something greener, less congested, and possibly something beautiful. No rage against the dying of the right angle. Just a sober embrace of something new.